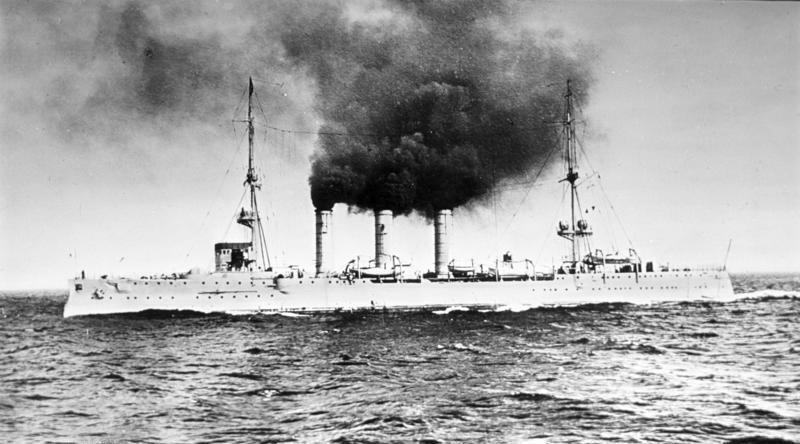 Among naval historians, the SMS Emden (built 1908) and her crew belong to a special group of unique ships that became legendary for their daring exploits in the face of overwhelming odds. 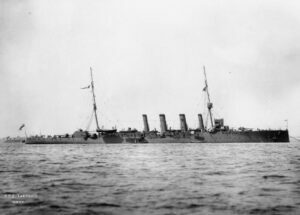 After giving the Allied navies around the Indian Ocean a big chase, capturing and sinking ships along the way, Emden finally met her end at the Battle of Cocos at the hands of HMAS Sydney. 2 weeks before that, she made an audacious raid on Penang, then a British port controlling the northern passage into the Malacca Straits from the Andaman Sea. When I was growing up in Penang, we made frequent crossings in the harbor ferry and used to imagine all kinds of sea battles being fought there. Little did we know that we were a lot closer to reality than we realized. 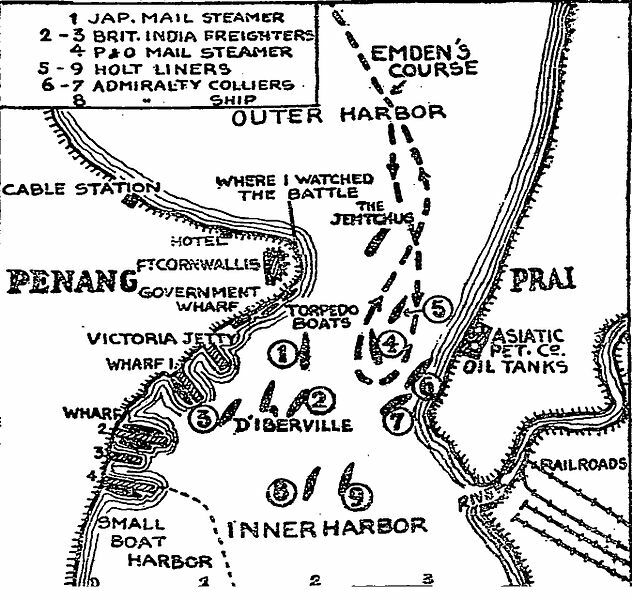 The Battle of Penang began in the early hours of 28th October 1914 when the Emden steamed full speed through the North Channel of Penang Roads spotting a fake fourth funnel and flying the British Royal Navy ensign. 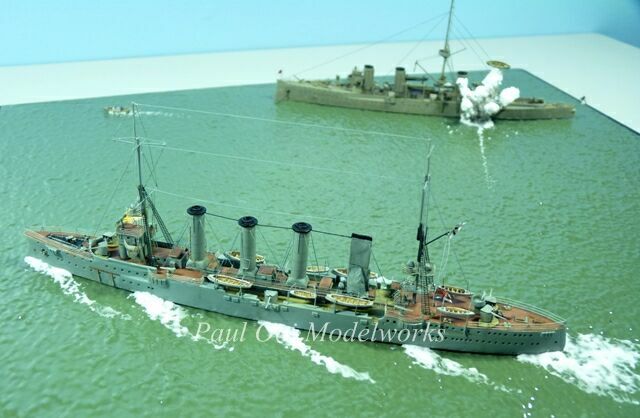 Harbor lookouts and French patrol craft took her for the HMS Yarmouth, a Town class light cruiser with 4 smoke stacks. Steaming into Georgetown Harbor, the Emden noted that the city was fully lit and could make out the silhouette of the Zhemchug anchored off Fort Pier. She launched her starboard torpedo at very close range which struck the Zhemchug close to the aft funnel. Once the torpedo struck, she at once fired her guns at the Zhemchug’s forecastle, injuring and killing many sleeping sailors. Moving past the stricken cruiser, the Emden spotted the shape of the French torpedo gunship d’Iberville and possibly several more allied torpedo boats to the south and may have decided at that point to turn around and leave the harbor. On her way out, the Emden fired her port torpedo at the Zhemchug striking the magazine and broke the latter into two. As she steamed out of the harbor towards open sea, the French destroyer Mousquet attempted to intercept but was also sunk with gunfire. The British colonial authorities and Allied navies were totally devastated by the raid as news of the Emden’s attack spread through the local population. My maternal grandfather was at the Penang Esplanade as they brought severely wounded Russian survivors to shore. One of my grand aunts who was born that week in 1914 was nicknamed “Emden”. 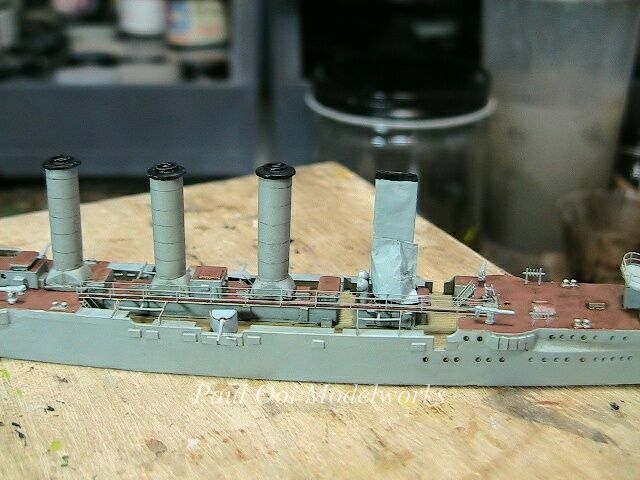 The 1/700 scale resin kit of the Emden is made by Midship. 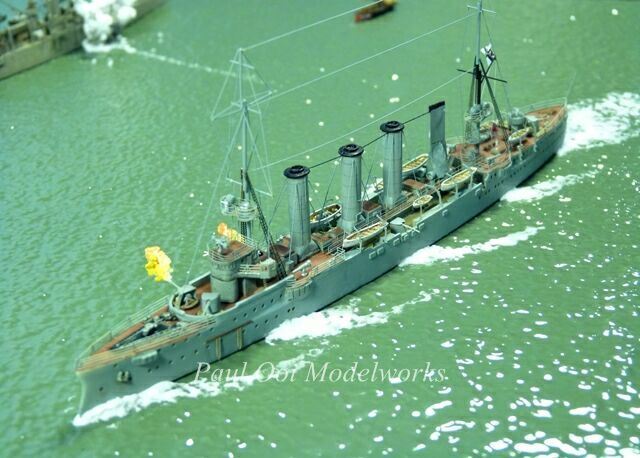 The kit included several metal parts for the searchlights and lifeboats and also a phtoetched fret for railings, platforms and a leftover vestige from the 19th century, shrouds. 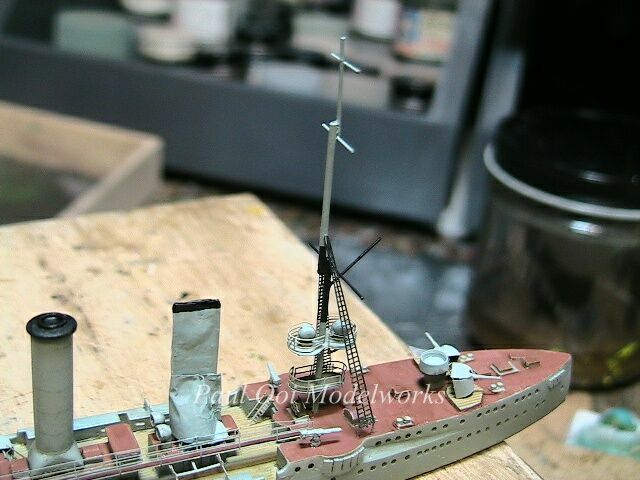 For the masts, the kit provided the builder with a single 6 inch section of R20 brass wire and you need to build the rest. 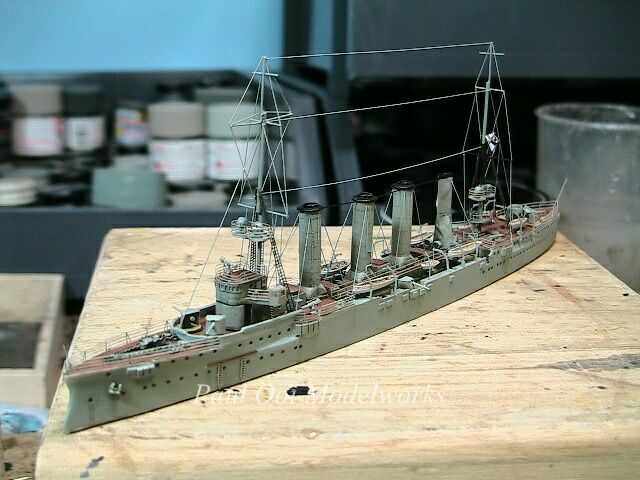 These resin kits make nice, rare ship models but they are not for the beginner. 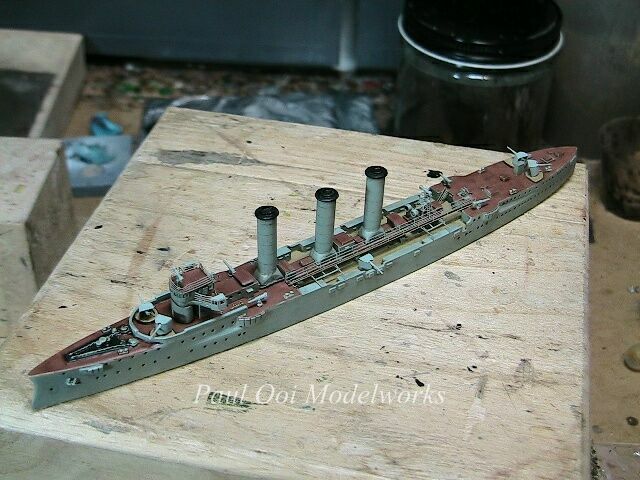 I start out by spraying the cleaned resin hull and funnels with Tamiya XF25 Light Sea Grey. Then the linoleum decks are painted with a 75% Tamiya XF69 NATO Brown + 25% XF2 White while the wooden decks are painted with a mix of 75% XF60 Dark Yellow + 25% XF2. 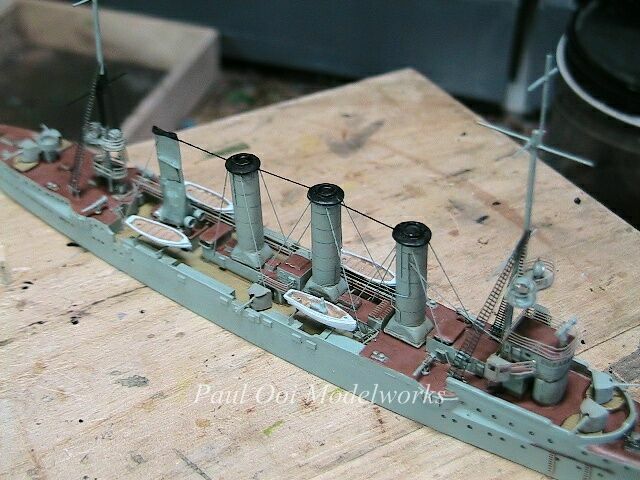 The funnels were molded without the characteristic rails around them that were visible on the Emden. Realizing that unless I can get very uniformed fine wiring wrapped around the funnels without looking out of scale, I used a different technique instead. 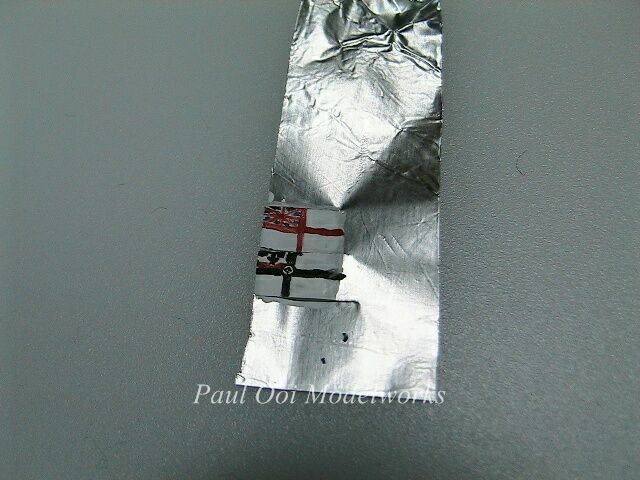 After painting the basic XF25, I used a flexible piece of Dymo plastic tape as a ruler and a pencil to trace the lines. After that, I sprayed a light dusting of XF25 lightened a few shades with white over the pencil lines and it looked just right. 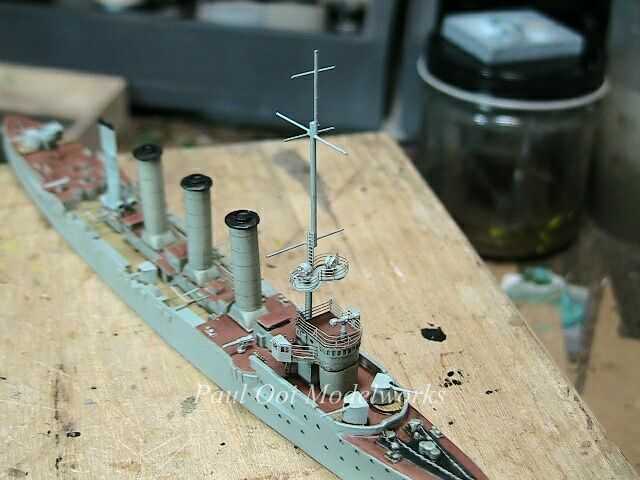 The gun turrets and railings were assembled next and these fitted into place easily. I really liked the long platform walkway lined with lifelines on the port side of the midship section, visible in this picture running between the forecastle to the quarterdeck along the three funnels. Now comes the tricky part, literally. As I mentioned earlier, Captain von Müller had used a fake funnel to gain entry into the harbor. No photographs exist of this structure but references to a similar ruse on the Graf Spee 25 years later are helpful. 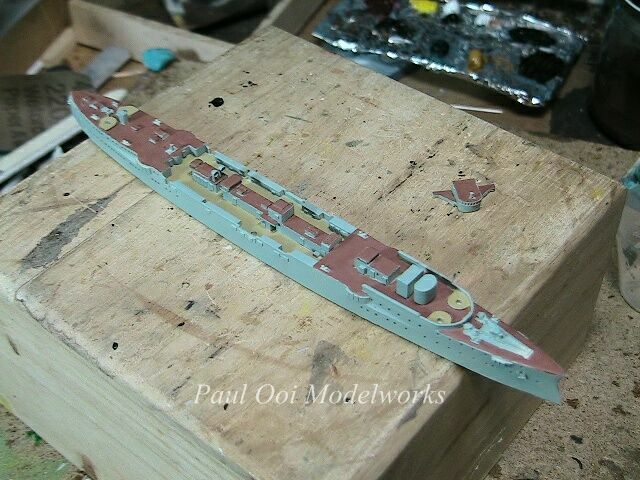 The structure on the Emden were described to be a creation of wooden sections, canvas and paint. 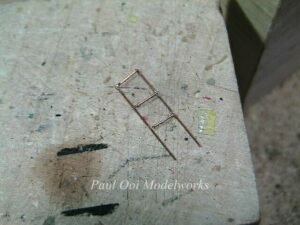 I started out making a flat panel wooden frame using bronze wires. 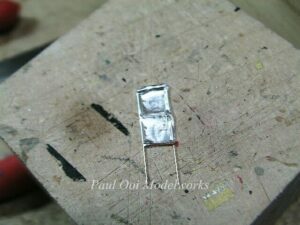 Once properly set, I stretched aluminum foil as fabric over that frame. When mounting the deceptive structure over the gun director platform, I also had to wrap some foil over that beautiful feature, then paint the whole thing XF25 to match the hull. The false funnel was convincing in poor light from a distance. 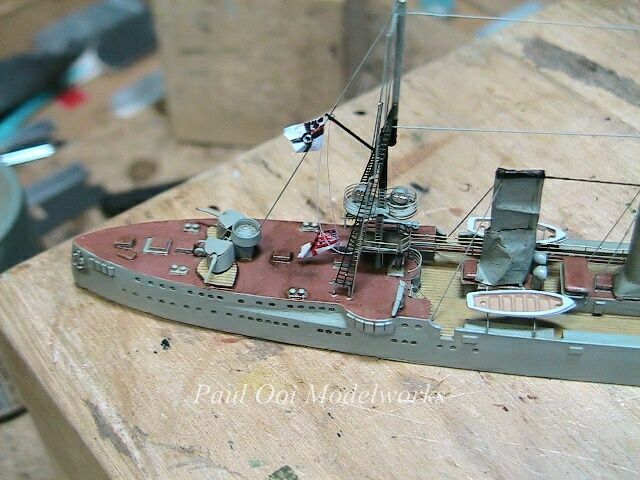 The structure was also secured with several cables to the deck and main mast. 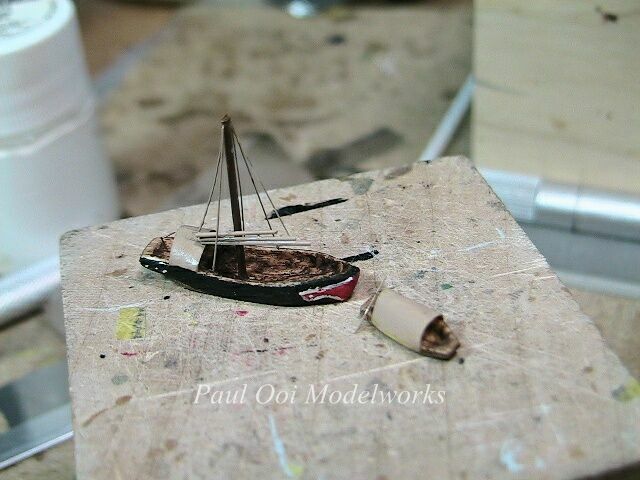 After that, I started constructing both the fore mast and the main mast. I used brass wires of three different sizes to build these structures. 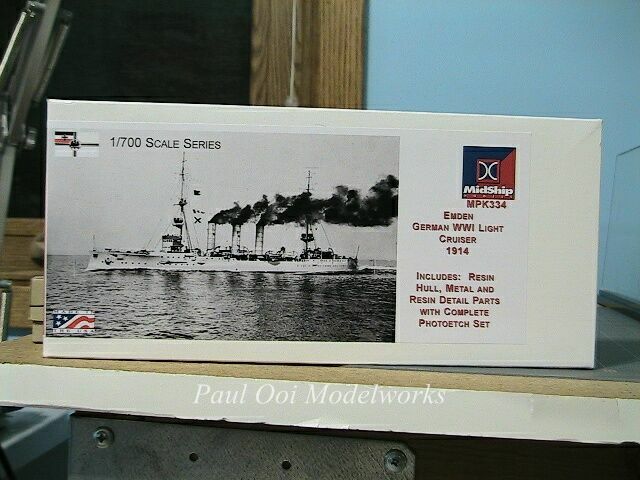 The kit came with several platforms for search lights that had to be slipped like rings onto the masts before attaching to the deck. After the masts were installed, I attached the shroud lines that came in the photoetch fret and then installed rigging. Next, the life boats and davits were installed. 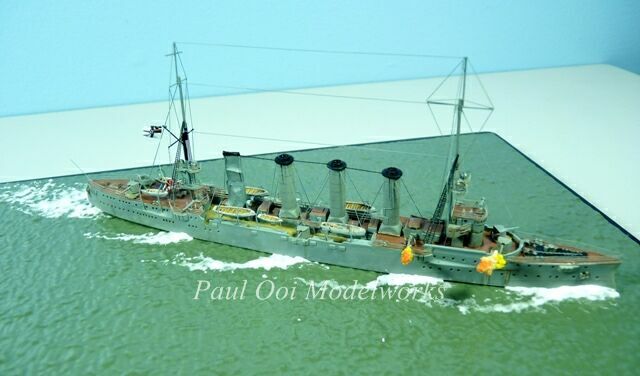 The lifeboats themselves are painted Light Silk Grey (almost white), which can be mixed with Light Ghost Grey FS36375 (or IJN grey XF12) 50% + White 50%. For the second part of the ruse, I made two battle flags, one British and the other Imperial German. The most likely method to achieve a quick flag changeover was to hitch the Royal Navy ensign first to the flag pulley line with the German ensign hitched further down on the same line, so that when the first flag was lowered, the same motion would pull the German ensign up. The Emden’s captain must have spent their layover time in Diego Garcia dreaming up these tricks. Finally, the lifelines were added to the bow and stern sections. 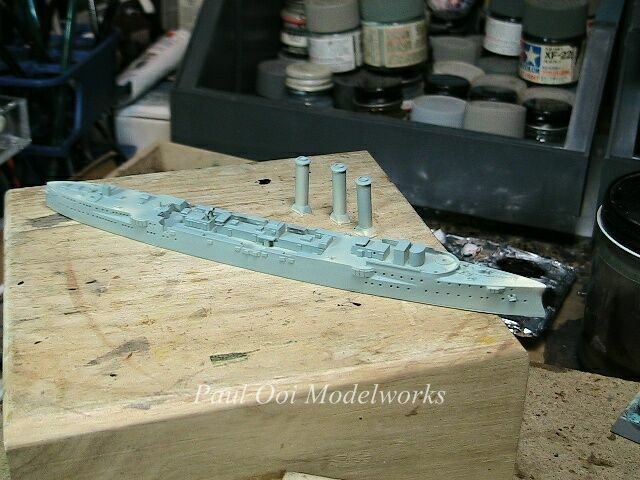 The Emden is ready to join the Zhemchug on the diorama. 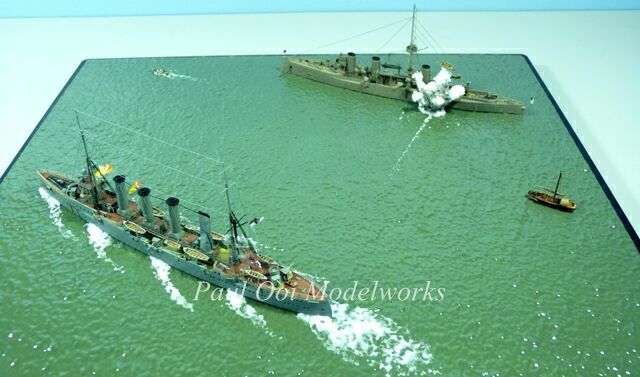 Just to add some interest to the diorama, I made 2 Asian watercraft that plied Georgetown harbor in those days. I carved these out of pine wood chips. First was a little sampan (shallow draft boat) with a large awning to ferry passengers to and from shore. The other was a coastal trader that was common in Penang and Singapore in those days, a Fujianese junk called a Tuakow. 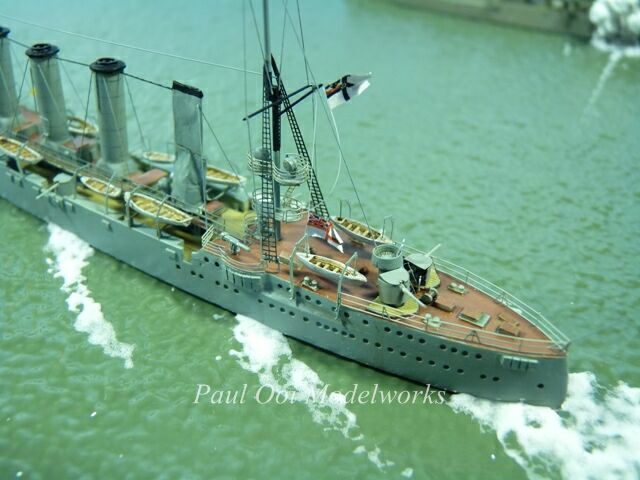 These came as either single masted vessels or larger 3-masted ones. The junks were always colorfully decorated at the bow and stern. Contrary to Allied reports, the Zhemchug was almost equal in size to the Emden and had heavier 120mm guns to the Emden's 105mm. Up goes the German ensign! The British ensign can be seen near the deck. The Emden ran parallel to the Zhemchug at 23 knots, evident from the wake. Paul Ooi Modelworks is a participant in the Amazon Services LLC Associates Program, an affiliate advertising program designed to provide a means for sites to earn advertising fees by advertising and linking to Amazon.com. Could you please tell how you made the smoke cloud from torpedo explosion & gunshots from Emden? These smoke flashes and explosion effects have to be carefully planned even as I build the models. I use brass wire cores for the basic shape of the explosion, coat it with light weight white plaster, and then paint them. 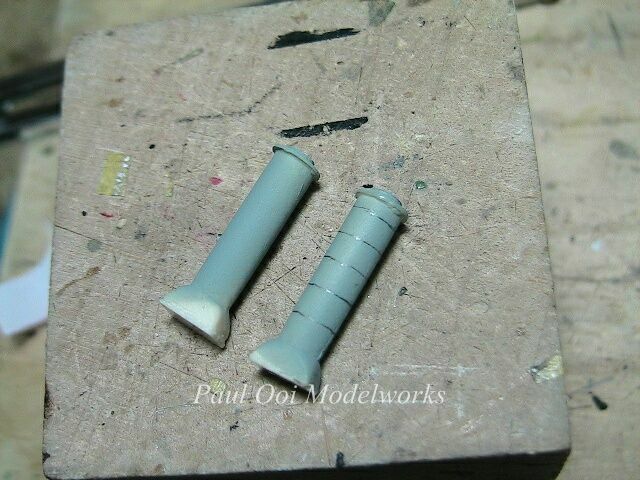 Once dry, they are attached just like any other part of the model. 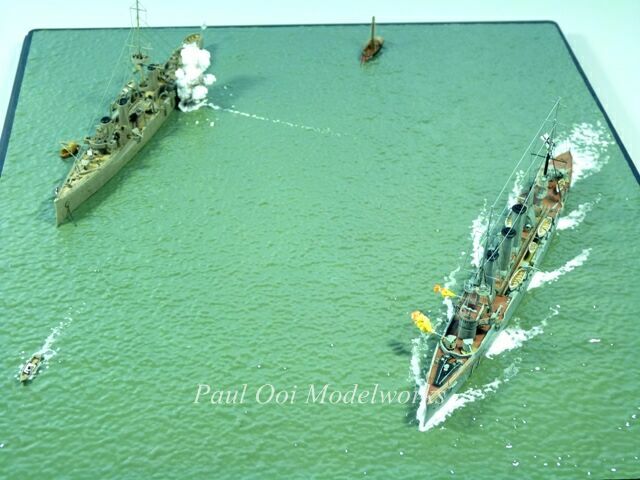 I am hoping to persuade a modeller/collector who is willing to display his diorama or dioramas in a museum (on loan or even outright purchase if within budget) in conjunction with a 100th anniversary commemorative exhibition of the Emden Raid in Penang Harbour planned for 2014 in Georgetown and Kuala Lumpur, Malaysia. 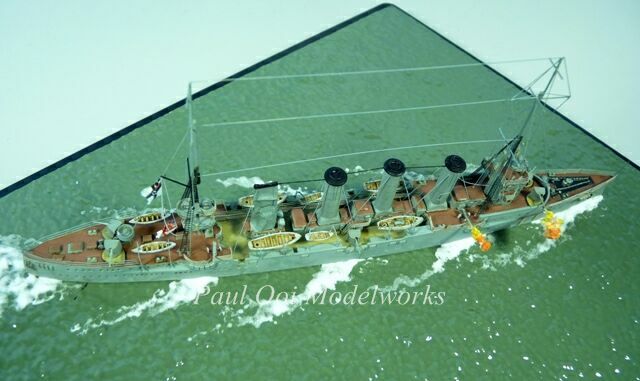 Besides the Emden and Zhemchug, we hope to also feature the Mosquet and the Sydney and perhaps more of the flotilla anchored in the harbour on the night of the Raid. Please contact me on my email address. Thank you. On va vous dire que ce n’est nullement erroné !!! Von Mucke gave an excellent first hand account of HMS Emden’s short lived adventures, including the construction of the 4th smoke pipe. He testified that no other deceptive measures were ever employed, and no British ensigns were ever displayed. 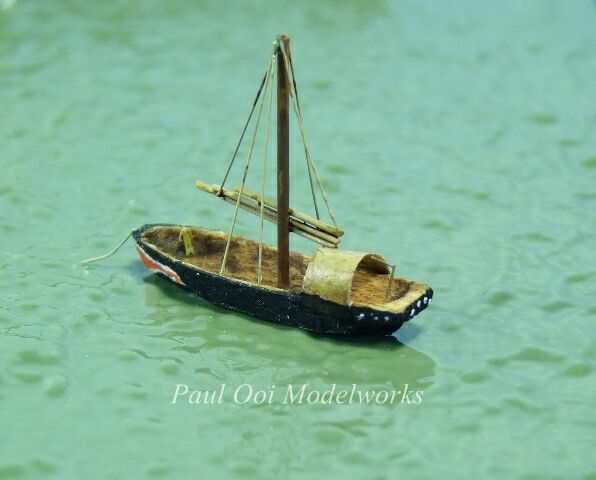 Paul Ooi Modelworks welcomes casual visitors browsing, and enjoying the pictures as well as more serious fellow modelers looking for tips and references on the art of making miniatures and relishing in the challenge. I will be more than happy to answer any questions you may have about the models. Please feel free to leave a comment or a question. 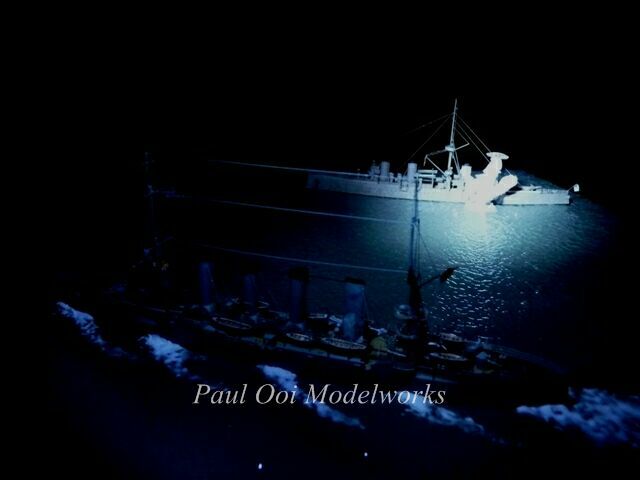 Copyright © 2011-2019 Paul Ooi Modelworks.